Here is the place, my lord; good my lord, enter. Prithee, go in thyself, seek thine own ease. Fathom and half, fathom and half! Poor Tom! Come not in here, nuncle, here’s a spirit! Through the sharp hawthorn blows the [cold] wind. Humh! go to thy cold bed, and warm thee. Didst thou give all to thy [two] daughters? have him now — and there — and there again, and there. [What,] have his daughters brought him to this pass? Couldst thou save nothing? Wouldst [Didst] thou give them all? Hang fated o’er men’s faults, light [fall] on thy daughters! slept in the contriving of lust, and waked to do it. sessa! let him trot by. Beware my follower. Peace, Smulkin [Snulbug]; peace, thou fiend! To obey in all your daughters’ hard commands. I’ll talk a word with this same [most] learned Theban. He said it would be thus, poor banished man! With him; I will keep still with my philosopher. 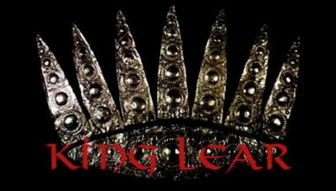 care : as king, Lear admits that he has not worried much about those less fortunate in his kingdom. superflux : superfluity; give the poor what you have in excess and don’t need. fathom and half : because of the downpour, Edgar like a sailor is taking soundings to check the depth of the water. Dolphin : possibly referring to the French prince or dauphin (much of what Tom says is nonsense). Swithold : an Anglo-Saxon saint who exorcised demons, walked over (footed) the wold (uplands), confronting the demon who causes bad dreams and her nine children, making her alight (stop riding the poor sleeper) and swear (plight her troth) to do no more harm. philosopher : in his madness Lear thinks of Tom as a wise man; likewise his references to Theban and Athenian (Greek). Kent : Gloucester does not recognize the disguised man he is speaking with (anymore than he does his son Edgar).